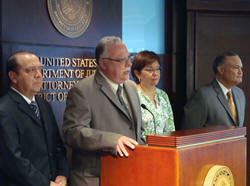 L-R: DEA SAC Javier Peña addresses the media during news conference at US Attorney's Office. L-Antonio Sagardia, Puerto Rico Secretary of Justice, U.S. Attorney Rosa Rodriguez, Distinct of Puerto Rico and Luis Fraticelli, SAC FBI San Juan. "Today's arrests are examples of DEA's success in aggressively pursuing those criminal organizations which exploit vulnerabilities in our airports, airline recruits and air transportation employees to facilitate their drug trafficking activities. With these arrests DEA closes another route for thousands of kilograms of cocaine to reach the United States or any other part of the world from Puerto Rico," said DEA Special Agent in Charge Javier F. Peña. "With the cooperation of the airline industry, the Puerto Rico Ports Authority and our law enforcement counterparts, DEA will keep drug traffickers away from our airports. By denying the drug traffickers alternate smuggling routes, we disrupt the flow of drugs into Puerto Rico and discourage the use of the island as a trans-shipment point in the Caribbean." If convicted, the defendants face a minimum of ten years imprisonment and a maximum of life imprisonment, with fines of up to $4 million. Agents from the Bayamón Strike Force, the Puerto Rico Police Department, and the Federal Bureau of Investigation participated during the investigation and arrests this morning.